3-Micina is azitromicine, a macrolide antibiotic that acts inhibiting the synthesis of bacterial proteins. This way it presents a broad-spectrum action against gram positive and gram negative bacteria, both aerobic and anaerobic. It is indicated for the treatment of infections caused by sensible bacteria. This antibiotic is considered effective to treat most of the infections located in the respiratory tract, both upper and lower (sinusitis, pharyngitis, tonsillitis, bronchitis, pneumonia), otitis media, infections of the skin and soft tissues. 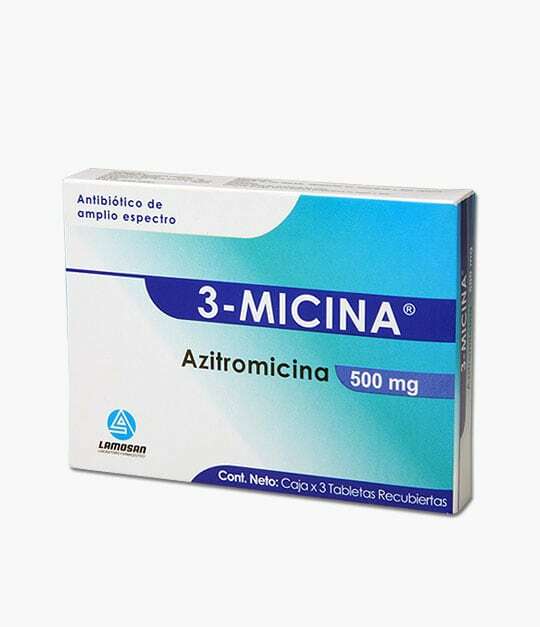 3-Micina is also effective to treat diseases of sexual transmission caused by sensitive micro-organisms such as Chlamydia trachomatis, Haemophilus ducreyi (soft chancre) and Neisseria gonorrhoeae (gonorhrea). Alifresh is a deodorant solution for use in the buccal cavity, it refreshes the breath, controls the bacterial growth and protects the oral tissues. The triclosan and the Zinc lactate in the formula destroy the bacteria that cause the bad breath, besides; the Xylitol regulates the buccal acidity and stimulates the production of saliva. The D-Panthenol lubricates the oral cavity. All these components work together into a delicious mint flavored solution making you feel completely secure even when you are very close. Alifresh provides delicious freshness to your breath in those moments that you need more. The active substance of BOROSAN is the “rising” oxygen, produced by its components in watery solution and in contact with the buccal mucosa. Oxygen exerts a germicide action, oxidizing all sensitive components of the bacterial protoplasm (probably enzymatic systems that are active in a reduced form). Anaerobic organisms are also destroyed by a high oxygen concentration in its environment; consequently, BOROSAN is a bactericide for them. In addition to the quickness with which it dissolves and produces oxygen, BOROSAN leaves an extremely beneficial cationic residue of alkaline reaction as a result of its decomposition, since it neutralizes the characteristic acidity of the buccal cavity with infection, putrefaction or fermentation condition. The oxidant action of BOROSAN comes together with another deodorant action; hence its usefulness to eliminate bad breath caused by these pathologic conditions. The effervescence produced by the oxygen released in the mouth also helps removing detritus from inaccessible regions. Its flavoring and aromatic substances give the patient a fresh and pleasant feeling. It is indicated as auxiliary treatment for pyorrhea, gingivitis and other buccal infections caused by germs sensitive to active oxygen. It is recommended as buccal-pharyngeal antiseptic and deodorant for cases of halitosis (bad breath). BOROSAN is available in 2 grams sachets, hermetically sealed to guarantee quality and correct dosage. It is not recommended using BOROSAN during very long periods. Indications for its use shall be provided by the odontologist. Bucagel is a gel for oral application. The active ingredients as chlorhexidine gluconate, triclosan and zinc lactate combine to achieve excellent antiseptic and anti-inflammatory action, additionally, the benzocaine blocks the annoying pain associated to these conditions. Bucagel provides instant pain relief and faster healing in all cases of canker sores, mucosal lacerations, surgical wounds or injuries. Package: Flexa tube of 10 g.
Cefulam is cefuroxime, an antibiotic that belongs to the second generation cephalosporines group. 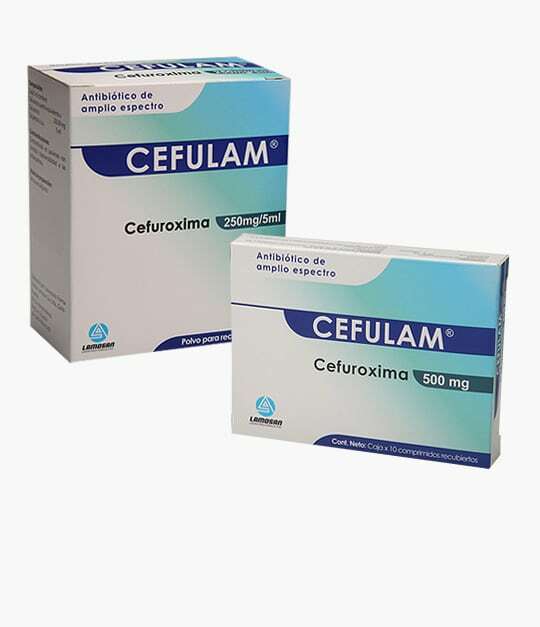 Cefulam has wide spectrum against gram positive and gram negative bacteria. Is useful in the treatment of infections caused by sensitive micro-organisms, especially those localized in upper and lower airways, upper and lower urinary tract, skin and soft tissues. When the first molars appear in the baby’s mouth, it is time to use Curakid toothbrush. It has 4260 ultra soft bristles, perfect for delicate infant´s teeth and gums. These special bristles allow a comfortable and adequate cleansing. The head of the toothbrush is rubber covered avoiding the risk of injuries. The anti slip handle fits infants and parents hand size. It also has a flat base ideal for maintaining the toothbrush stood avoiding contamination. Denture Kids toothbrush is presented in funny colors. CURAPROX 5460 is a megasoft bristles toothbrush focused in dental care of people who requires special care of the mouth with high cleaning effectiveness. Compact Head: 5460 CUREN bristles. Plastic cap that prevents dust accumulation. Bristles: polyester filaments, with 6 times less water absorption than nylon, allow them to keep its original firmness longer. Handle: made of polypropylene, lightweight, strong and very flexible which allows it to bend the brush head. Anatomical 8 sides design. CURAPROX 5460 is the best choice for daily brushing, is suitable for children, pregnant women, diabetics, patients with head and neck oncology radiation treatment and chemotherapy, ie people with systemic problem that requires special oral care. They can also be used by all family members. 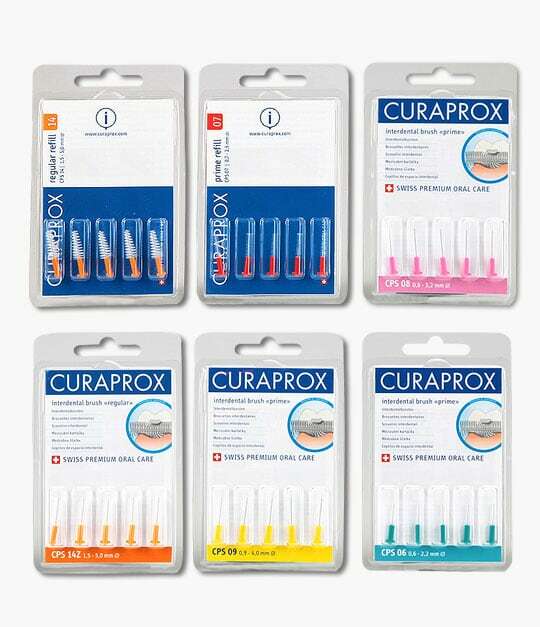 Package: CURAPROX 5460 Brush comes in a wide range of colors. This special floss is indicated for dental cleaning in people using dental implants, bridges and partial dentures. Their special features offer three benefits in a single thread. Dental Floss is composed of three parts, the first is called threader, is rigid and helps to insert the wire into the interdental space, the second, fluffy and wide, helps to clean the interdental space and the third part is the smooth floss, similar to common dental floss, which cleans hard to reach areas such as interdental contact points. When you are trying to improve your oral hygiene, Curaprox dental floss is the perfect complement. After proper brushing, always is recommended using a mint flavored high quality dental floss, waxed to improve control of cleaning and protect both teeth and gums. Each one comes in a plastic dispenser with 50 meters of floss. It is a specially designed brush for cleaning teeth in patients with fixed orthodontic treatment. His head has 5460 polyester bristles that form a grooved contact surface in order to avoid binding the toothbrush with brackets. With Curaprox Ortho you can afford the best dental cleaning that otherwise would be impossible. This is a toothbrush specifically designed to clean brackets, implants and attachments. The Curaprox 1009 toothbrush for orthodontia has an exclusive design of one single wick with CUREN type ultra fine bristles of 9 mm length. This special characteristic allows obtaining one hundred percent control of plaque buildup in orthodontia braces, implants and attachments. One hundred percent control of plaque buildup on the gum line. Great accessibility to difficult places for plaque removal. All of this is made in a soft and non-traumatic manner. It is a child toothbrush developed for children from 5 years old, retains the shape of the adult 5460toothbrush but is smaller. It has a whopping 7600 CUREN ultrasoft bristles with 0.08 mm in diameter each. This high density of bristles on a smaller head results in unsurpassed cleaning power brush, extreme softness and comfort for children’s mouths. DENTA FIRME forte is a product prepared with polymers that develop a high degree of fixing and adherence when it is in contact with surfaces both of gums and total prosthesis. DENTA FIRME forte is a specifically designed adhesive to provide fixation to poorly adapted dental prosthesis, whether due to a manufacturing defect or because time elapsing has retracted the gums and denture cannot be fixed as before. Most users of total dental prosthesis wish to have said prosthesis completely adhered, so that they can talk, eat or laugh in a safe manner. Both powder and cream increase the fixing and adhesive property of the prosthesis in order to create confidence in those persons that for different reasons need extra assurance when using its total dental prosthesis. Is a brush for cleaning dentures, with extra hard bristles is ideal for cleaning the gums, teeth, and chewing surfaces of dentures. Dentafirme brush has a bristle tuft suitable for cleansing of channels and others sites, otherwise, hard to get. It also has an anatomical hand grip which facilitates and optimizes the cleaning. Pediatric dental cleaning gel with Xylitol at 10%. Baby’s teeth starting to come out in the oral cavity also need protection and care since the first moment of their appearance. Milk, formula and all foods leave residues in the baby’s mouth. The oral hygiene is the key point to keep a healthy mouth. Dental brushing allows teeth to remain clean, without bacterial plaque accumulation, which causes enamel demineralization and presence of cavities. A correct brushing technique added to a dental paste composed of the appropriate ingredients to project teeth and oral tissues provide the necessary prevention measures in order to maintain a good oral health of your baby. Denture BB is a dental gel specially designed for babies still on milk and infants under 3 years. Its only active ingredient is Xylitol, a natural fruit extract. DENTURE BB must be used for the daily teeth brushing, 2 or 3 times a day, unless instructed otherwise according to the professional best criteria. It does not produce foam and does not need to be washed. It can be swallowed without causing side effects to the baby. Package: Flexa tube of 30 g.
DENTURE BB toothbrush has been designed to clean and massage the gums of infants still on milk and small children. Its shape adapts to an adult’s finger so that it can provide hygiene that is so necessary even since these tender ages. This “finger toothbrush” is made up of silicone with fine and smooth bristles located at its distal end. At the same time it massages the gums and cleans the baby’s mouth and teeth. We suggest its use with our DENTURE BB dental gel for infants still on milk and children up to 3 years old. Toothpaste with Xylitol, Vitamin E, Fluoride and Aloe Vera. DENTURE Encías toothpaste is designed to provide the best care and help in the treatment of gum conditions such as gingivitis or periodontal disease. Denture Encías is the best alternative for the daily care of the gums because it reduces inflammation, reduces edema, eliminates bacteria that causes gingivitis, controls bad breath and protects tooth enamel. Xylitol, Fluoride, Vitamin E, Aloe Vera, D-panthenol, Lactate, Zinc and Cetylpyridinium together are a highly effective combination for the treatment of gum diseases. Package: Flexa tube of 110 g.
Pediatric dental cleaning gel for Kids. DENTURE KIDS is a gel for dental cleaning that gives continuity to the line of care that begins with DENTURE BB. It is suitable for the oral and dental care in children of 3 to 10 years. The formula has been carefully studied to offer the best care in this important stage of the development of the dental pieces and other buccal structures of the children. The dental hygiene is the key point to maintain a healthy mouth. The dental brushing allows teeth to remain clean, without bacterial plaque accumulation, which causes enamel demineralization and presence of cavities. A correct brushing technique added to a dental paste composed of the appropriate ingredients to project teeth and oral tissues provide the necessary prevention measures in order to maintain a good children’s oral health. DENTURE KIDS contains Xylitol at 10%, a fruit extract worldwide recognized due to its property for not producing cavities, preventing its formation and stopping the progress of those cavities already existing. The aforesaid added to the fluoride, which action fortifies the dental enamel make DENTURE KIDS the best toothpaste for a total prevention. Additionally, DENTURE KIDS contains Calcium Lactate like a calcium donator due it is well known that xylitol joints calcium and makes up a calcium xylitol complex that prevents dental demineralization and facilitates its remineralization. Package: Flexa tubes of 50 g.
Dental cleaning is often difficult in children. This leads to early tooth decay, so it is important to strengthen the teeth. Denture Kids is a mouthwash indicated in children with risk of demineralization and decay due to high sugar diet and poor oral hygiene. Additionally, children with amelogenesis imperfecta, dental demineralization due chemotherapy treatments or dental hypersensitivity will be greatly benefited with the action of this tasty mouthwash. Denture Kids has xylitol and fluoride in its composition. Xylitol is a natural product that prevents cavities, remineralize tooth enamel, regulates pH and removes cavities producing bacteria. Fluoride provides to enamel a greater ability to resist the acidity and prevent tooth decay. When the mere touch or brushing causes bleeding gums, it is time to use Gingit. Gingit is toothpaste useful for care and maintenance of swollen, enlarged or reddened gums. Regarding the ingredients, the aluminum lactate helps reduce edema, triclosan combats plaque, Aloe vera helps with inflammation and protects soft tissues throughout the oral cavity, as the d-panthenol whose emollients , regenerative and nutritional actions supplements formula to provide the best care for your gums and your entire mouth. Package: Flexa tube of 56 g and 110 g.
Mainly due to the presence of bacteria plaque the gums may present inflammation symptoms such as tumefaction, bleeding, pain. These symptoms may be efficiently treated by means of persistent brushing with GINGIVIT, a toothpaste specially formulated for gums weakened by the periodontal disease. The active principles of GINGIVIT are Aluminum Lactate at 1%, and 2, 4, 4, trichloride-2-hydroxy-definil-ether (triclosan) at 0,2%. The first one belongs to the astringent category, and acts precipitating the proteins. It has a low penetrability when locally applied, maintaining its action on the cellular surface and on the interstitial spaces. The astringent action is accompanied by tissue contraction and crumpling. The cementing substance of the capillary endothelium gets hard so the pathological transcapillary movement of plasmatic proteins decreases, thus reducing the edema, transudation and local inflammation. Triclosan is a broad spectrum antibacterial agent with action over gram positive bacteria such as streptococcus, clostridium, lactobacillus and styphylococcus, even over those stumps resistant to penicillin and meticillin, and gram negative bacteria like E. coli, Haemophilus, klebsiellas, and salmonellas, among others; it also has a strong action against fungus like candida, aspergillus, microsporum and more. It also has anti-inflammatory properties by acting as inhibitor of the prostaglandins synthesis. Slight but frequent hemorrhages of affected gums are controlled by the styptic action of GINGIVIT, which coagulates the blood, plugs the capillaries, reduces inflammation and maintains free from bacterial attack the affected region. Each brushing with GINGIVIT constitutes and antiseptic oral rinse of great help. Due to the tetrasodium pyrophosphate present in its formula, GINGIVIT acts dissolving the tartar and eliminating the bacterial plaque, therefore, it attacks the primary cause of the problem. Daily brushing with GINGIVIT progressively cleans the plaque, eliminating inflammation and improving buccal cavity general condition. GINGIVIT also has the exact quantity of sodium phosphate monofluoride to rapidly and effectively strengthen the dental enamel against the action of acids causing cavities. Package: Flexa tubes of 112 and 56 g.
Mouth Rinse for gingivitis and periodontal disease. The new mouth rinse GINGIVIT is effective in the treatment of gingivitis and periodontal disease. It is useful for maintaining gingival health in all cases involving inflammation. 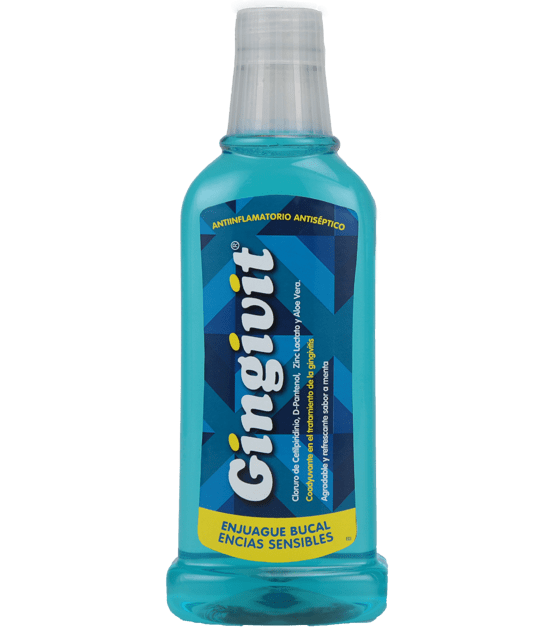 The GINGIVIT mouth rinse formula contains cetylpyridinium chloride with antiseptic action, zinc lactate which promotes gingival anti inflammatory action plus aloe vera and D-panthenol, which maintains vital and moist gums. Use after brushing teeth with toothpaste GINGIVIT. Package: Bottle of 300 and 500 ml. Toothbrushes have been designed with the purpose of helping control bacterial plaque buildup, which is the main cause of periodontal disease. The problem of common toothbrushes is that its bristles are too thick, hard and separated, favoring bacterial plaque buildup in the interdental spaces. The excessive pressure when brushing the teeth causes dental abrasion, injuries, gums’ retraction, dental hypersensitivity and a rapid deterioration of the toothbrush. In order to avoid these consequences, toothbrushes with softest and thinner bristles shall be used so that said bristles deeply penetrate in the gum-teeth union and remove a greater amount of plaque without injuring the tissue. Its anatomic and flexible 8-side handle allows an optimum 45 degrees inclination angle to favor a correct brushing. Cleaning interdental spaces requires toothbrushes specifically designed for this purpose. Interdental Curaprox toothbrushes have been designed to provide an effective cleanliness of these spaces, control bacterial plaque and the multiple diseases that its buildup produces. The interdental Curaprox toothbrushes have different sizes that fit the interdental spaces of each person. These toothbrushes are manufactured with the exact quantity of bristles and a more fine and resistant center made out of surgical steel CURAL®, which provides greater resistance against breakage and wear due to its use. They are easily placed in an anatomic handle designed to facilitate individual cleanliness. Your odontologist shall be responsible for recommending the right size of toothbrush for your interdental spaces. Use it after normal brushing and prior to your last mouth rinse. Anti-inflammatory and analgesic COX-2 selective. Lamocox is meloxicam, a medicine with analgesic, anti-inflammatory and antipyretic properties. It acts eliminating the inflammatory process by blocking the prostagladin synthesis through a partially selective inhibition of COX2. Lamocox is indicated for the treatment of all those inflammatory processes accompanied or not by pain and fever, being these processes severe or chronic. It comes in boxes containing 10 grooved tablets of 15 mg. each. Package: grooved tablets of 15 mg - 10 x box. ODONTO Smoker’s is a toothpaste specifically formulated for people consuming tobacco, whether by means of cigarettes or by means of chewable tobacco. These habits produce changes in the oral cavity, darkening teeth, causing bad breath and weakening gums. The formula compounds combine pyrophosphates with fluoride to obtain a solvent action in the bacterial plaque, plus a polishing and strengthening action in the dental enamel. Continuous use of ODONTO Smoker’s results in whitening, protective and refreshing effect in the oral cavity. ODONTO Smoker’s was designed to provide a cleaning effect and an additional protection to those persons that really need it. ODONTO Smoker’s is indicated for those patients desiring to obtain a real refreshing, whitening and protective effect in their teeth and gums. For patients whose teeth have a yellowish coloration or have been stained due to the smoking habit. It must be used as common toothpaste substitute, making a vigorous brushing three times per day. Package: Flexa tube of 112 g.
Each capsule contains amoxicillin trihydrate equivalent to 500 mg of amoxicillin base. The amoxicillin is a broad-spectrum antibiotic with excellent action when administered orally given its acid resistance characteristics that allow an adequate absorption in the intestinal tract. Its plasmatic concentration time is superior to the one of the ampicillin, thus allowing its administration in longer periods of time. Allows a broad margin of action to the doctor when treating infectious processes of the oral cavity and upper respiratory tract, since the respiratory tract infections are usually caused by bacteria sensitive to the molecule. For exodontia of teeth with infection processes. For extraction of third back tooth to prevent infections. For periodontics in case of periodontal abscess. In general, to prevent and combat buccal-pharyngeal infections. For prophylaxis of endocarditis caused by sensitive bacteria, administered before surgeries in the buccal cavity. It is contraindicated in cases of hypersensitivity to penicillin or cephalosporin. Package: capsules of 500 mg box 20. Analgesic, anti-inflammatory, non-steroidal capsules for Dental Use. Odontogesic is a NON-STEROID anti-inflammatory analgesic agent, non-narcotic, derived from the propionic acid with inhibitory activity of the prostaglandin synthase and high binding capacity to proteins. After its oral administration the sodium salt of naproxen accelerates the absorption of the medicine in the higher part of the intestinal tract, because it produces a rapid and effective therapeutic effect. Exodontia of dental pieces and extraction of third molars. Periodontics, for gingival inflammatory processes: gingivitis, stomatitis, periodontal abscesses, etc. In general in all cases in which it is necessary to eliminate or prevent pain and/or inflammation. Patients allergic to NSAIDs, peptic ulcer, gastrointestinal disorders, kidney failure, pregnancy and breastfeeding. Package: tablets of 550 mg packages x 20. Bacterial plaque is the main cause for oral diseases such as cavities, gums inflammation and infection, bad breath, etc. Adequate oral hygiene is basic to keep a good oral health, however, sometimes it is necessary the use of specific substances to help control those harmful bacteria in our mouth in order to prevent the development of oral diseases. Odontoseptic is a mouthwash whose main ingredient is the chlorhexidine. This substance is an effective antiseptic of broad-spectrum against microorganisms gram positive, gram negative, yeast and fungus, not being susceptible the acid-resistant bacillus, spores and virus. Due to its chemical characteristics it has a great capacity to adhere to the cellular wall of the microorganisms, as well as to some saliva components and to the dental enamel, with long-term release, thus making the drug even more effective. Its time of action is of 12 hours. Odontoseptic has chlorhexidine at 0,12%, concentration of election as anti-plaque agent and anti-gingivitis associated to plaque. The second active compound of Odontoseptic is xylitol. Xylitol is a natural origin sugar that eliminates or inactivates the bacteria producing cavities and at the same time controls the oral acidity and teeth recovers lost minerals. Gingivitis and acute and chronic necrotizing gingivitis. Stomatitis due to dental problems. Patients with motor type problems. Package: Bottle of 240 m.
Currently more and more people undergo orthodontia treatments. The use of brackets facilitates bacterial plaque buildup due to the difficulty that tooth cleaning represents. This produces teeth enamel demineralization with the consequent presence of whitish stains and possible cavities. ORTODENT BRACKETS is a mouthwash that takes advantage of the chamomile properties, indicated for patients with orthodontia treatment. Chamomile inhibits the dental bacterial plaque formation accumulated around the brackets. It also prevents bacteria colonization, and at the same time prevents the formation of acids that demineralize teeth leaving an unattractive whitish pigmentation. Furthermore, chamomile prevents gingival inflammations caused by microorganisms that may affect the parodontum. Xylitol is a substance that has non-cariogenic, anticariogenic and cariostatic properties, in other words, does not produce cavities, prevents its formation and stops the development of existing ones. Fluoride and xylitol combine its action, strengthening its anti-cavities power as well as its enamel remineralization power. ORTODENT BRACKET´s components and its way of action make its use safe and pleasant, and it can be utilized for long terms without any undesirable secondary effects. ORTODENT BRACKETS is indicated for all patients with orthodontia treatment at any age. Due to its innocuousness and benefits offered it may be used in all type of patients. Package: Bottle of 240 ml. Toothbrushes have been designed with the objective of helping control bacterial plaque buildup, which is the main cause of the periodontal disease. The problem with common toothbrushes is that its bristles are too thick and tough, thus favoring bacterial plaque buildup in interdental spaces. Excessive pressure during tooth brushing process when making the dental cleaning causes dental abrasion, grazing, gums retraction, dental hypersensitivity and a quick deterioration of the toothbrush. In order to avoid these consequences, toothbrushes with softer and thinner bristles must be used since they deeply go into the gum-tooth union and remove a greater quantity of plaque WITHOUT INJURING TISSUE. Dental hypersensitivity is the most discomforting and painful feeling of teeth when facing stimuli such as cold, hot, exposure to acids (citric), tactile stimuli (tooth brushing) or any other combination thereof. It appears as acute pain, often confused with cavities presence. Hypersensitivity is a symptom resulting from aggressions at dental enamel level, or due to gum reabsortion at neck level of tooth. The teeth neck is the most sensitive area of the tooth and when dental tubules are exposed easily captures all thermal, chemical and tactile stimuli giving a pain response. SORAL-CE has a renovated formula that offers bigger benefits to people that suffer of dental hypersensitivity. Strontium chloride present in the formula seals the dentin tubules helping to control hypersensitivity. Triclosan, a substance of proved antiseptic action, that prevents bacterial growth and keeps the mouth free of pathogen bacteria. Tetrasodium pyrophosphate assures a decrease in plaque formation in each tooth brushing. We have improved the SORAL-CE´s formula adding Aloe vera and Pantenol, two natural extracts with regenerating, healing and anti-inflammatory properties. Thus, using SORAL-CE we obtain the best result for dental hypersensitivity treatment, better cleaning of the teeth with each brushing and a superior care in teeth, gums, tongue and other tissues of the mouth. SORAL-CE is indicated for cases of primary dental hypersensitivity (tooth pain when consuming cold, hot, sweet or acid food) due to opened necks. For very acute cases it is recommended to alternate the use of SORAL-CE with SORAL-F.
Package: Flexa tubes of 100 g.
Dental hypersensitivity is a very discomforting and painful feeling of teeth when facing stimuli such as cold, hot, exposure to acids (citric), tactile stimuli (tooth brushing) or any other combination thereof, present when the dentin is exposed to buccal environment. It is considered that more than 25% of the population suffers of this uncomfortable problem. Potassium nitrate present in SORAL-F mouthwash formula acts directly over the sensitive nerves that capture painful stimuli, helping this way to control hypersensitivity. SORAL-F mouthwash formula has been complemented with Triclosan, a substance of proved antiseptic action that prevents bacterial growth. SORAL-F mouthwash contains fluoride, basic element in the process of dental enamel remineralization, which additionally hardens the enamel, helping to control cavities formation. Consequently, by using SORAL-F mouthwash we obtain better results in dental hypersensitivity treatments. SORAL-F mouthwash is indicated for dental hypersensitivity (tooth pain when consuming cold, hot, sweet or acid food) in those cases where for some reason it is difficult the tooth brushing or after teeth whitening. Some of the most common causes of this condition are: teeth gradual and physiologic wear due to mastication, enamel wear due to ingestion of acid food, and enamel wear due to an incorrect tooth brushing. SORAL-F has a renovated formula that offers bigger benefits to people that suffer of dental hypersensitivity. Potassium nitrate present in SORAL-F formula acts directly over the sensitive nerves that capture painful stimuli, helping this way to control hypersensitivity. We have improved the SORAL-F´s formula adding Aloe vera and Pantenol, two natural extracts with regenerating, healing and anti-inflammatory properties. The daily use of SORAL-F provides the exact amount of fluoride that hardens the enamel, helping to control cavities formation and dental enamel remineralization. Thus, by using SORAL-F we obtain best result for dental hypersensitivity treatment, better cleaning of the teeth with each brushing and a superior care in teeth, gums, tongue and other tissues of the mouth. SORAL-F is indicated for secondary dental hypersensitivity cases (tooth pain when consuming cold, hot, sweet or acid food) due the wear of the teeth’s enamel. For very acute cases it is recommended to alternate the use of SORAL-F with SORAL-CE. Package: Flexa tubes of 110 g.
The SURGICAL toothbrush is designed for post-surgery care in oral surgeries. It has a diamond shape head where 12000 ultra fine 0,06 mm thick soft mega type bristles are compacted. These characteristics make SURGICAL toothbrush ideal to obtain a deep cleaning of sensitive dental tissues without causing pain, an easy and precise access to those affected dental tissues, as well as a precise local application of antiseptic solutions. Its use is recommended for post-surgery hygiene in oral surgeries, implants, periodontics, radiotherapy treatments, etc. Anti-inflammatory, local analgesic and disinfectant of the buccal mucosa. TOPIDENT is a medicament of external use indicated for mucosa inflammations of oral cavity and pharynx. It is useful for cases of gingival inflammation, oral aphtha and other type of ulcerations. Topident’s beneficial properties are the result of its formula, which is a combination of: iodided iodine complex, recognized as one of the most effective germicides and fungicides; benzocaine, an active local anesthetic of low solubility, slow absorption and low toxicity; aluminum sulfate with its astringent capacity controls the gingival exudates. All these components are dissolved in a glycerinated vehicle that makes Topident an external use product of pleasant flavor, easy penetration and simple application in the affected area. It is indicated for acute and chronic inflammations of buccal-pharyngeal mucosa. It is effective for treatment of gingival problems, excoriations caused by dental prosthesis; oral aphtha and other type of ulcerations or mycotic conditions of buccal cavity. Package: Bottle of 10 ml with applicator. Rapid relief for the discomfort caused by teething. Teething is a natural and spontaneous process. However, it is preceded by inflammation, reddening, itching and sting pain of the gingival tissue, causing a lot of discomfort to the baby. TOPIDENT Infantil has been specially formulated to provide rapid relief to teething discomfort. In fact, in a simple manner we have combined: The Benzocaine, which exercises its action as local anesthetic, and due to its low solubility and slow absorption turns to be more durable and toxicity-free. The aluminum lactate has a slight astringent effect and its action clears and strengthens the gum. The glycerinated and aromatized vehicle makes TOPIDENT Infantil an external use product of pleasant flavor and of gentle and painless application. All the components are harmless; therefore, if applied according to instructions this medication is safe for your baby. TOPIDENT INFANTIL is recommended for the discomfort caused by baby’s teething as well as for those symptoms causing pain and gingival inflammation to the little patient. Limón No. 2110. Santa Cruz de la Sierra. ATE VITARTE, LIMA 3, Lima.